It turns out the key to making a bloody, gritty and malevolent crime flick really pop with emotion is to put a cute puppy front and centre. Adapted from Animal Rescue, a short story by Dennis Lehane, The Drop plunges us into the heart of the Brooklyn underworld. Here the 1970s apparently never ended, the place all ruinous streets criss-crossed with warrens of stinking, garbage strewn alleys all populated by characters who look like they've wandered out of a particularly stygian pulp novel. Our guide through this underworld is bartender Bob Saginowski (Tom Hardy), a tactiturn man with an impressive poker face. He works for Cousin Marv (James Gandolfini), proprietor of the imaginatively named 'Cousin Marv's Bar'. This is a pretty average den of iniquity, populated by blotchy-nosed barflies with bad posture who spend their nights guzzling crap bottled beer while glued to sports. But once every so often, without much notice at all, the titular 'Drop' happens. As outlined in a Scorsese-flavoured montage, every night in Brooklyn a thousand dirty deals go down and a lot of money changes hands. That dough has to get to the mobsters in one piece, and it does so by being funnelled to one, randomly chosen, bar. This is known as 'the drop bar', so for just one night some dingy dive could have tens of thousands of dollars quietly sitting in its safe. But with sinister, psychopathic Chechen gangsters in charge of the system you'd have to be crazy to rip off a drop bar. Right? You don't have to be the world's greatest detective to work out what's going to (and does) happen in The Drop. But the central crime that powers the narrative is merely the fuel for a sprinkling of interpersonal conflicts and relationships that combine into a tapestry of working class society that most would like to pretend vanished sometime in the late 1980s. The real real plot kicks off when our bartending hero hears a squeaky bark coming from inside a bin. This turns out to be the mewl of an abused Pit Bull puppy. The bins are outside Nadia's (Noomi Rapace) house, a former veterinary assistant. With Bob looking on nervously she patches up the dog as best they can, before handing it over to a slightly perturbed bartender who has no idea how to take care of a puppy. Before long he's named it Rocco and Bob and Nadia are forming a burgeoning relationship over him. Though the dog presumably has no idea what the hell is going on, he nonetheless becomes the most important character in this twisty/turny crime drama. Getting audiences to care about a cute puppy is a powerful (if a smidge manipulative) way of getting us emotionally invested and it pays off gangbusters. When someone threatens the puppy we bristle with anger, when the puppy might be in danger our heart is in our mouths, when characters make big sacrifices we implicitly understand that they're necessary – for god's sake just don't hurt the puppy! Our opinions of most of the lead cast are reflected through the prism of this puppy. Emotionally damaged couple Bob and Nadia gain much of their sympathy through their careful tending of the puppy's wounds and bond over dog shopping, dog walking and dog babysitting. Meanwhile the villains are primarily defined as evil for their intentions towards Rocco: in particular principal dog-abuser Eric Deeds (Matthias Schoenaerts), one of the scummiest scumbags that's slithered across a screen this year. Leaving the dog aside for a moment, The Drop boasts a bevvy of fine performances. Tom Hardy continues to hold the title of the actor who does the most acting while not doing anything at all. He's got this Clint-ish acting superpower of being able to fill the frame with his face and hold our attention for minutes at a time, conveying volumes of information through tiny flickers of his eyelids or slow curling of the corner of his mouth. With this and Locke it's been a great year for Tom Hardy's face in film, both taking full advantage of his mastery of intense minimalist performance technique. Given that this is James Gandolfini's final performance his character comes loaded with extra-narrative pathos. It's difficult not to read the role in the light of his death; the character a failed, depressed small-time heavy lashing out in desperation as he sees his final chances of success slipping between his fingers. Scruffily bearded, haggard and beaten-up by life, Marv is a sad character, shuffling around under a cloud of shame for never earning any respect. 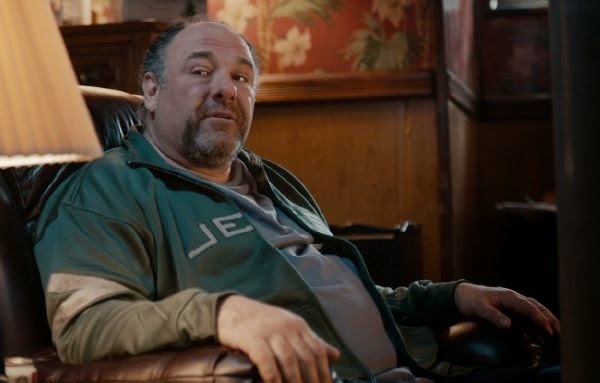 Gandolfini knocks this bum character out of the park, Marv earning our sympathy even as he swirls around around the U-bend of life. There's a sense this urban environments is grinding its inhabitants down to dust. Most of the characters appear to live in the decaying shells of their dead parent's houses. This symbolically links them to the beaten-up fighting dog discarded in a trash can incredibly pregnant – these people, heroes and villains alike, are all traumatised from past abuse and struggling to find some rock of kindness to cling to in their urban nightmare. This is presented as a inevitable cyclical process, the events of the film continuing this soul-crushing grind and presenting no escape route from their personal hells. Or they would if there wasn't a one scene coda to the film that boneheadedly spoils it all. In what I can only assume to be a studio-mandated reshoot, the film goes on after the ending to show that, actually, everything worked out for the best after all! Given that the actors have notably different haircuts it's pretty obvious that they've been called back from another shoot to wrap this up in a vaguely pleasant manner. To be honest it's probably best to pretend that this doesn't happen, as The Drop is a largely successful, stylishly shot and smart crime thriller that more than earns an ambiguously miserable closing shot that's stolen from it at the last minute.